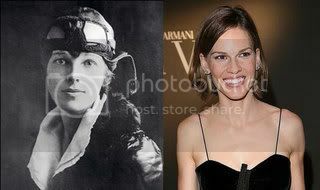 After her awesome portrayal of Alice Paul in Iron Jawed Angels, I'm totally excited about the choice of Hillary Swank to play Amelia Earhart in the upcoming biopic Amelia, which is currently in production and expected to hit theaters in 2009. I also couldn't be any more jazzed about the fact that the director of this film is none other than the amazing Mira Nair (of The Namesake, Vanity Fair, and Monsoon Wedding fame). Meanwhile, Amy Adams is set to play Amelia Earhart in Night at the Museum 2, which is also due out next year. 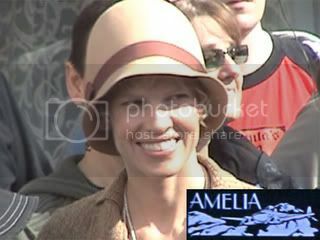 It's kinda cool to see Amelia Earhart getting some big-screen recognition. I always thought she would have made a good addition to the time-travelling group of historical figures in Bill and Ted's Excellent Adventure, but they decided to go the token route and make Joan of Arc the only girl in the group. And she didn't even have any lines in the movie! Oh, it definitely counts for something. It's just too bad that they didn't include more female figures. And Clue! That movie is bursting with great female performances. When Madeline Kahn says, "I hated her so. Much. Flames. FLAMES... at the sides of my face..." Love it. As a soon-to-be graduate student, I'm going to have to start reading your grad student blog.